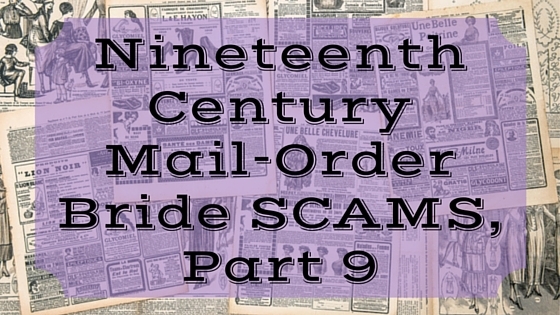 The previous eight articles within the Nineteenth Century Mail-Order Bride SCAMS have illustrated various types of fraudulent methods, crimes, and the consequences. One common thread through all is the criminal’s intention to capitalize on their victims’ loneliness and desire for love and companionship. Some brides-elect and grooms-elect actually had their intellect about them enough to recognize when things weren’t quite right (even if fraud was not involved in one out of three incidences)… and made prudent decisions about their course of action. The first three articles are very short, and the last one a little longer and so worth it! 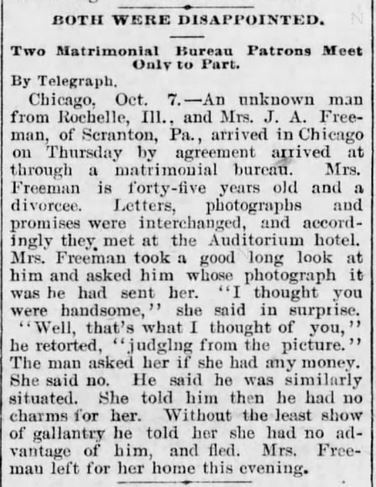 The following is an excerpt from an article that ran in the Chicago Daily Tribune, 13 October, 1902. The Proprietor, a married man, fraudulently conducted a courtship through the mail without using his legal name, a criminal act. “Riggs,” however, was not at the station to meet his bride-elect, and the girl went to the National hotel, Van Buren street and Wabash avenue, and waited for the coming of the bridegroom. When he did not put in an appearance Miss Crosby called at the Harrison street police station and took Inspector Lavin into her confidence. 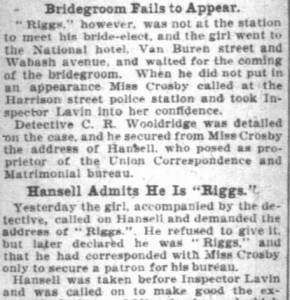 Detective C. R. Wooldridge was detailed on the case, and he secured from Miss Crosby the address of Hansell, who posed as proprietor of the Union Correspondence and Matrimonial Bureau. Yesterday the girl, accompanied by the detective, called on Hansell and demanded the address of “Riggs”. he refused to give it, but later declared he was “Riggs,” and that he had corresponded with Miss Crosby only to secure a patron for his bureau. 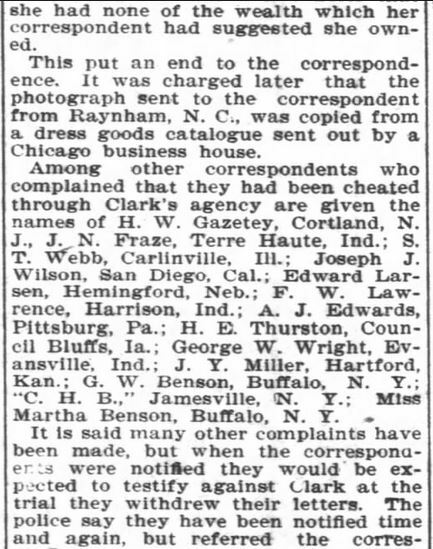 A portion of the article from the Chicago Daily Tribune, transcribed immediately above. Transcription stands in place of this article segment as the scan’s quality is difficult to read. The San Francisco Call of San Francisco, California, on 1 November, 1900, Thursday. Page 6. The discovery of this fraudulent matrimonial agency uncovers a new (at least to my series of articles) strategy–wherein the “bride elect” had no idea anyone circulated her name, address, image, or supposed financial status. I’m impressed by her decision upon receiving a letter from a man she’d not met suggesting they marry. It seems ridiculous, now, with only part of the story, why a fraudulent bureau would allow a patron to send mail directly to a woman who had no idea she was in their books as a potential bride. Wouldn’t it make more sense for them to use stock letters, create an appealing and entirely fictitious name, and handle all correspondence within their office? There must have been more to the story than divulged to readers of the Asheville Citizen-Times. Note: The “Dart Didn’t Pierce” lead-in is in reference to Cupid’s Arrow, or in this case, Cupid’s Dart. 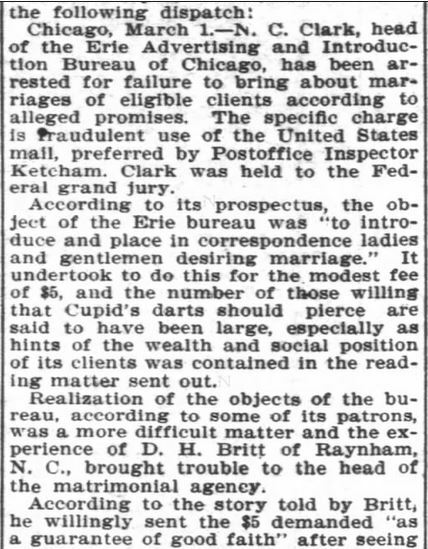 Matrimonial agencies were often referenced with ties to Cupid in United States Newspapers in the East and in the West. Bureau scam Asheville Girl Part 1. Asheville Citizen-Times. Asheville, North Carolina, on 10 March, 1902. Bureau scam Asheville Girl Part 2. Asheville Citizen-Times of Asheville, North Carolina on 10 March, 1902. Bureau scam Asheville Girl Part 3. 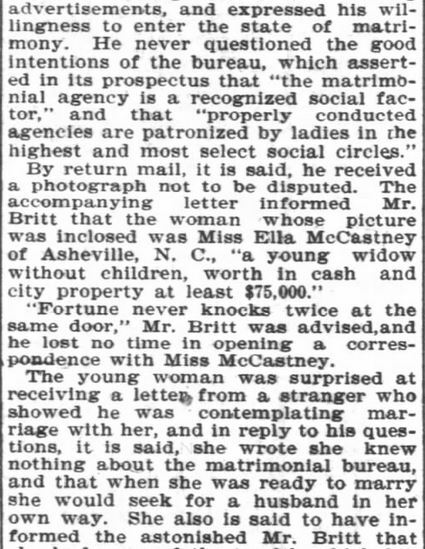 Asheville Citizen-Times of Asheville, North Carolina on 10 March, 1902. Bureau scam Asheville Girl Part 4. 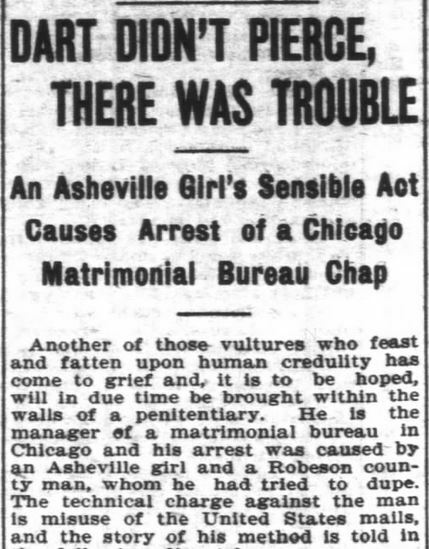 Asheville Citizen-Times of Asheville, North Carolina on 10 March, 1902. Bureau scam Asheville Girl Part 5. Asheville Citizen-Times of Asheville, North Carolina on 10 March. 1902. I want to believe that in a climate with so very many scams run by virtually every criminally minded man and woman that folks were as careful as they knew how to be. These examples cite the care with which many approached marriage bureaus. The optimistic news is that many people did marry after a courtship conducted by mail (however brief), and those additions to this series of articles is on the way! I look forward to sharing with you many happy circumstances where couples met due to correspondence (usually with a marriage bureau or matrimonial service of some kind) and lived many happy years together. a Matrimonial Bureau run by a man named Chinn, accused of having purchased pictures of Actors and Actresses and passing them off as candidates for marriage. I love these articles. 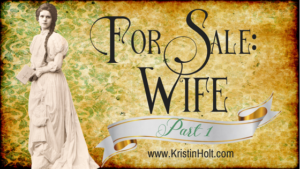 It sheds light on the reality of what may have happened to mail-order brides heading for love and security in the West. I love reading the sweet mail-order bride books and the stories of love blooming out of nowhere. 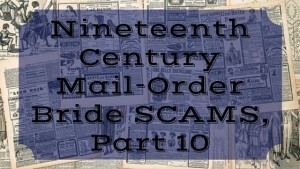 With the many scams perpetrated on people today, no one should be surprised that this also happened in the past. Thanks for the informative articles, Kristin. 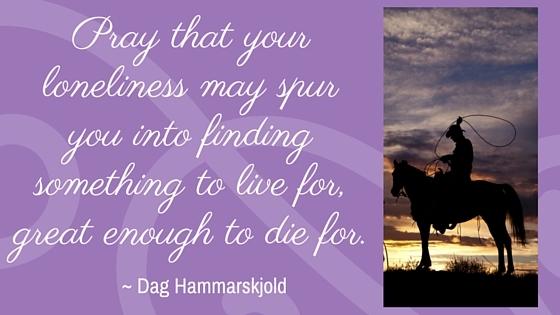 I’ll continue to read the romance books and believe in the happiness of everyone involved. I’m so pleased you’ve found this series of articles enjoyable. 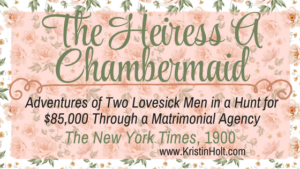 I, too, love sweet mail-order bride books…enough to both read and write them. I agree that the beauty of finding love after marriage is pretty amazing. So backward from the modern standard of things where love comes first and brings about marriage. I think there’s something beautiful about a husband and wife discovering love together. Many thanks for stopping by and sharing your insights and thoughts. So far, just three more (a total of 12) scheduled in this series. I might find myself tempted with a couple more. 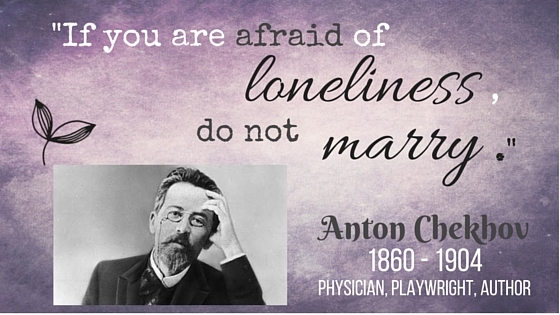 =) Can’t wait to start sharing the Mail-Order Bride SUCCESSES in history.